Please, singing is what I want to do with my life. I need help. How do I hit higher notes? And once I do, how do I get the “vibrato” that every good singer seems to have? My voice is OK, but its dreadfuly flat and boring. help, help HELP! Some questions are difficult to answer targeted to your issues because I don’t know your voice, so I’ll give the most general answer here that’ll be most likely to help the most people wanting to learn how to sing high notes. I don’t know what you consider high, but here’s what happens. As the average singer ascends in pitch, they typically take too much weight with them. 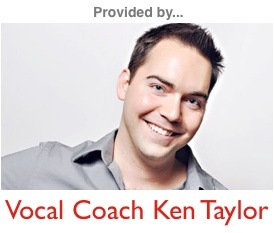 A vocal coach might refer to this as pulling chest voice (said differently, singing to high in chest voice). There are a couple of things that you want to make sure happen while you’re singing higher. 1. Keep your tongue relaxed. If the base of your tongue starts to tighten up, it will raise your larynx, making it even more difficult to sing higher and almost guaranteeing that your voice will crack if you keep heading in that direction. 2. Try to keep the same flow of air as you ascend in pitch. DON’T add more air, or take away air. Singing should feel the same as talking whether your singing high, low, or in the middle part of your range. Now, the above are much more easily said than done, so my final piece of advice if you’re not able to figure this out on your own is to find a good teacher in your area that’s able to help trick your voice into doing this. Not all teachers are created equal, so be sure and check around for who has a successful track record. When it comes to your other question, vibrato is the natural product of a relaxed voice. So my guess is if you get rid of any tension you may be experiencing while trying to sing higher, you might just find that vibrato kicks in on its own. I hope this helps! Readers feel free to add your comments below. Have Trouble in Front of Big Crowds? How Can You Shift Between Falsetto and Modal?